Bloomberg New Contemporary 2014 Lucy Joyce, from north London studied Foundation in Art & Design 2004-2006 and then BA Fine Art 2006-2009 at Chelsea. She recently came to visit us for a short interview. Allowing yourself the time to dedicate a great deal of time to your practice, whilst being surrounded by like-minded people. This peer group was really important. In education your peer group and those conversations are what you come away with. We’ve kept in touch and continue to work together in our professional lives. For example I have a solo show coming up in January 2015 where two of my Chelsea peers are creating the publication with me. I also keep in contact with my tutor Dave Beech, who is always free for a catch up over a cup of tea. He had a big impact on my development. I always aim to pop in and say hi to 3D technicians such as John Sullivan from the wood workshop who taught me so much. My time on Erasmus exchange to Universitat de Kunst Berlin for six months. That was when developed into a more monumental scale…size wise. 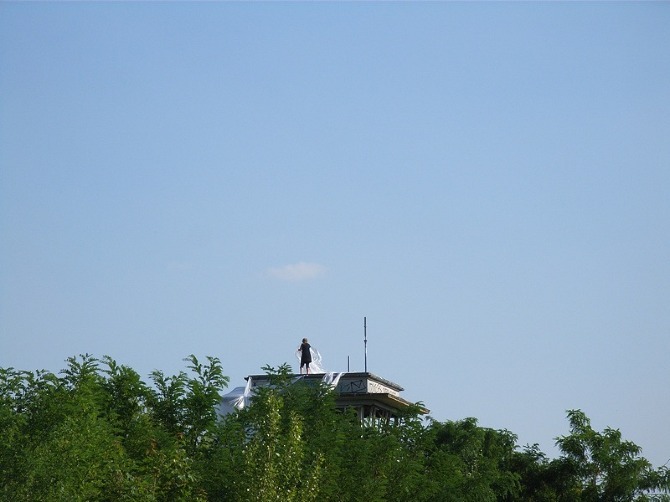 At that time I took over derelict buildings in Berlin, I made a couple of pieces of work on an old watchtower. How did you enjoy living in London? I was born in north London and London is my home. The hardest thing was and is still balancing part time work and studying. This continues to be the case as a practicing artist. What has been your greatest challenge in your professional life since then and how have you overcome it? The constant shift of having a studio then not having a studio and how this effects your work including its scale. Being part of the current Bloomberg New Contemporaries 2014, working within the schools and teachers programme at Tate Britain and Tate Modern in 2013-14, and winning the 2012 Villiers David Travel Award, for which I trekked up Mount Echo and screamed! This was a re-enactment of a piece I made at Chelsea. What is your main profession now? I work as a creative mentor at St Marylebone School part time alongside my art practice. And lastly, what would you say to anyone thinking of studying at Chelsea? Follow on Lucy Joyce’s website. Don’t miss out on seeing Lucy’s and a number of other Chelsea alumni in the Bloomberg New Contemporaries 2014 show at the ICA gallery in London. The show runs until Sunday 25th of January.